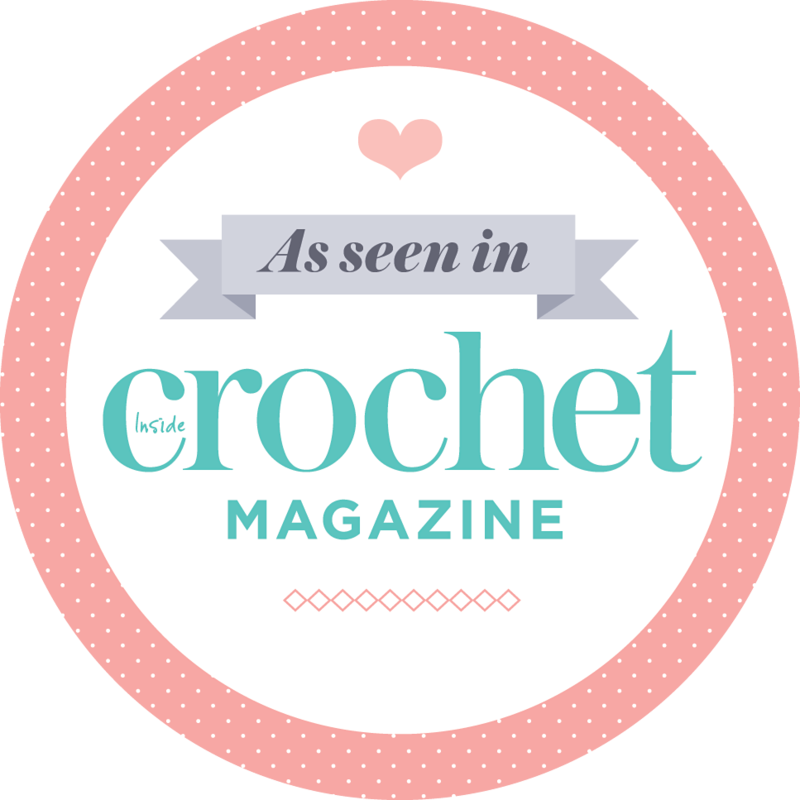 Posted by Natasja in My crochet, Ta-daah! 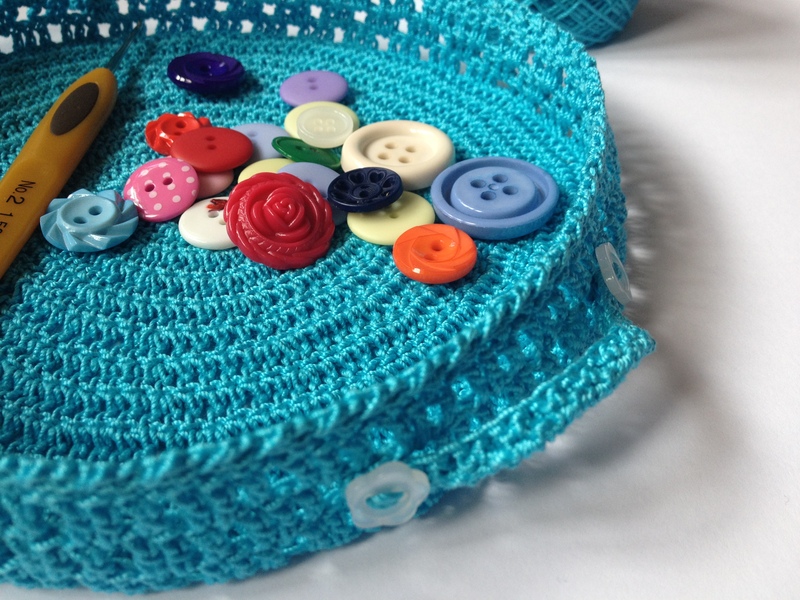 In October 2012 I blogged about the great selection of Anchor crochet cotton I won. 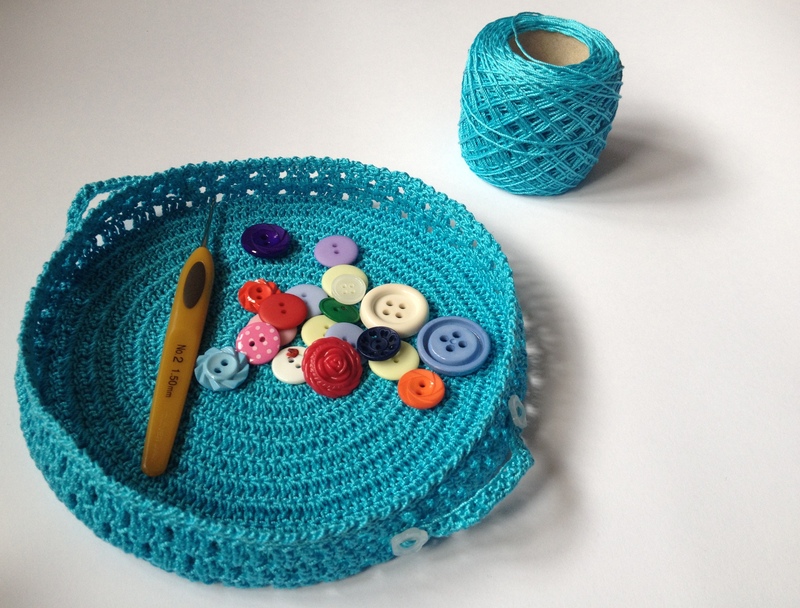 In that post, which you can read here, I said that I would use the crochet thread for a cell/mobile phone cover, a basket and a doily. 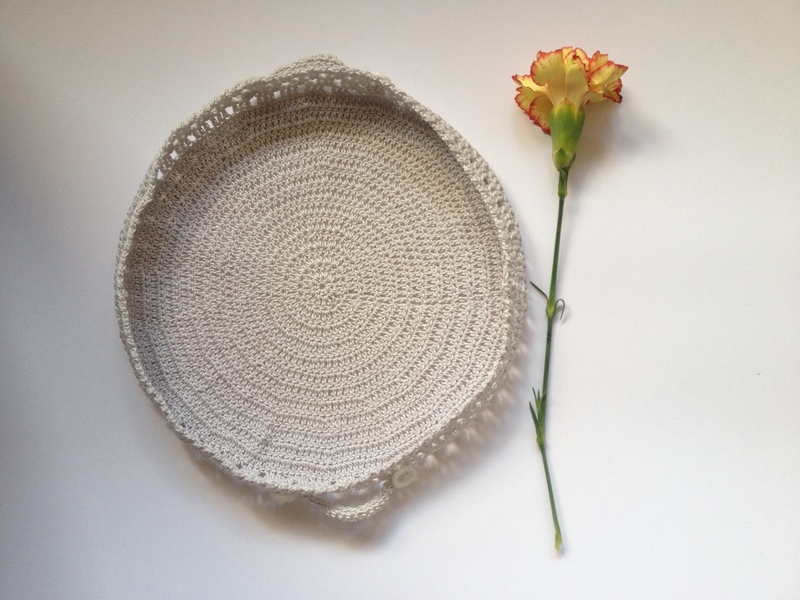 I haven’t got round to the doily yet, I did make the cell/mobile phone cover but before I could photograph it for you I lost it (read: fell asleep on the train with the cover on my lap and jumped up when the train got to my station), and today I’m showing you the basket. The basket is not big, and it’s shallow, but I think that’s a good thing. Working with crochet cotton I don’t think the sides would have been able to stand up if there were any more than 3 rows. I especially love the little handles on the sides. You need very small buttons though! It was such an easy pattern and pretty result, that I ended up making two. Pattern: Lace Baskets from the Kyuuto! Japanese Crafts! 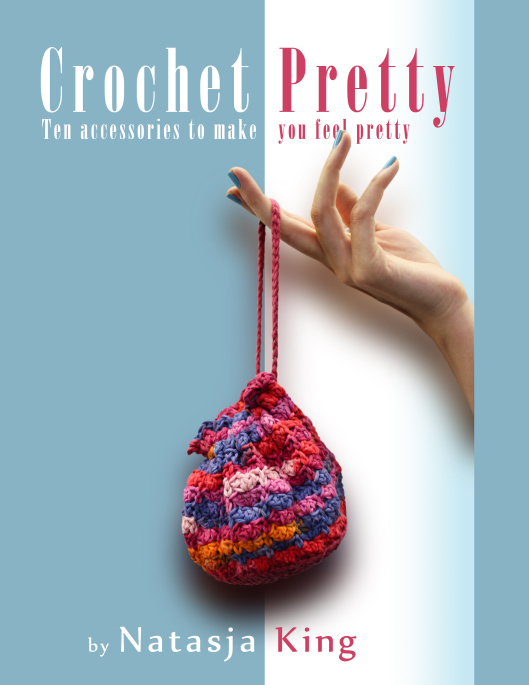 Lacy Crochet book. Modifications: For the silver grey basket I had to add an extra round before starting with the sides, as the crochet thread is thinner than the Freccia 6 and I wanted my baskets to be the same size. I’m giving these baskets away to friends on foreign shores so my desk still needs a basket for post-it notes and pens. I think I’ll make my one in shades of green. Striped! Very pretty! How would you feel about starching these or part starch e.g. the sides only? I actually did spray starch the sides lightly, but it didn’t hold up so well. Lovely little trays. The handles with buttons really make them special. Another great use of crochet thread. Thanks for sharing. Gorgeous! I love the turquoise one. I really like the turquoise basket. Hi! You can make the sides taller by doubling the rows to twice the height you want, then making a circle of stiffening material (I like to use thick acetate) to reinforce it, folding the excess rows over to contain the stiffening ring. I find that decreasing the folded-over part by a few stitches makes it fit better. The acetate is transparent. You can also choose a stiffening material that is opaque and contrasts with your stitches, highlighting them further. One other thing I do is work the folded over part in a simple/plain stitch, like all sc or hdc, when using the transparent acetate. You can also work the folded over part in a contrasting color. Or you can use a stiffening ring of an opaque material that is pretty, like cardboard laminated with a beautiful paper. Love the idea of putting your keys in it. I have a wooden bowl for the keys and it sure makes a ‘clunk’ when they enter, or even get taken out. But then again, I’m super auditory sensitive, or just plain full of nonsense. Holy cow, I can’t believe you did that with a 1.5 mm hook. Girl, you cray cray! I used a 1.5mm on my filet crochet Day of the Dead bunting and each one took me 3-4 hours! I’m never doing that again! Really lovely! 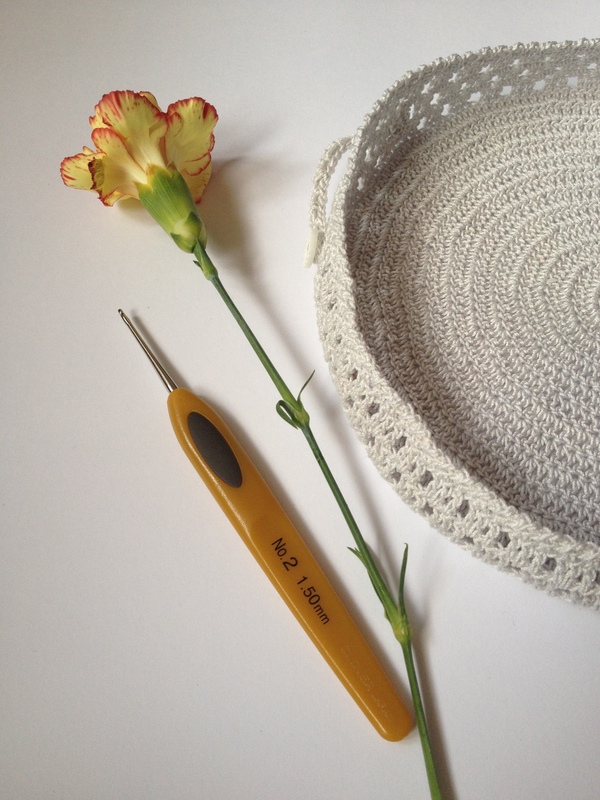 I don’t think I’ve ever used a hook as small as 1.5mm – eek!